The settlers are perplexed by the discovery of a bullet, and wonder if it is evidence of pirates or of other island inhabitants. Pencroft resolves to construct a boat to circumnavigate the island’s coast. Two more mysterious incidents happen: Neb and Herbert find a large turtle, which they turn over and prop up with rocks to prevent its escape. When they return with a cart to fetch it, it has disappeared. Next, when they explore the island in their new boat, they find a large chest stranded on the beach. W18_SC No less than a quarter into the project’s lifespan and I was already experiencing a burn out. My colleague introduced me to a book, Visual Intelligence by Donald. D. Hoffman, which inspired my concept for the week. I found that turning to external sources for inspiration were a good way of revitalizing my interest in the text, as I was able to construct my diagrams through an alternative frame of reference. I applied the theory of the subjective circle – whereby the illusion of a circle is created through specific placement of lines – to my hypothesis about the ambiguous circumstances happening within the narrative. W18_BT I chose to do something more playful and illustrative this week, and represented three of the mysterious incidents in simple geometric form (mostly because I couldn’t get the image of the poor turtle struggling on its back out of my mind). This contrasts greatly with Sher’s diagram, which was much more intellectual and went beyond a mere depiction of the narrative. The settlers tow the chest to Granite House and force open the locks. They find that it contains tools, weapons, instruments, clothes, utensils, books, and so on, but there is no clue as to who was the original owner. They proceed on an expedition down the river Mercy, during which they identify more flora and fauna, but no sign of human inhabitants. 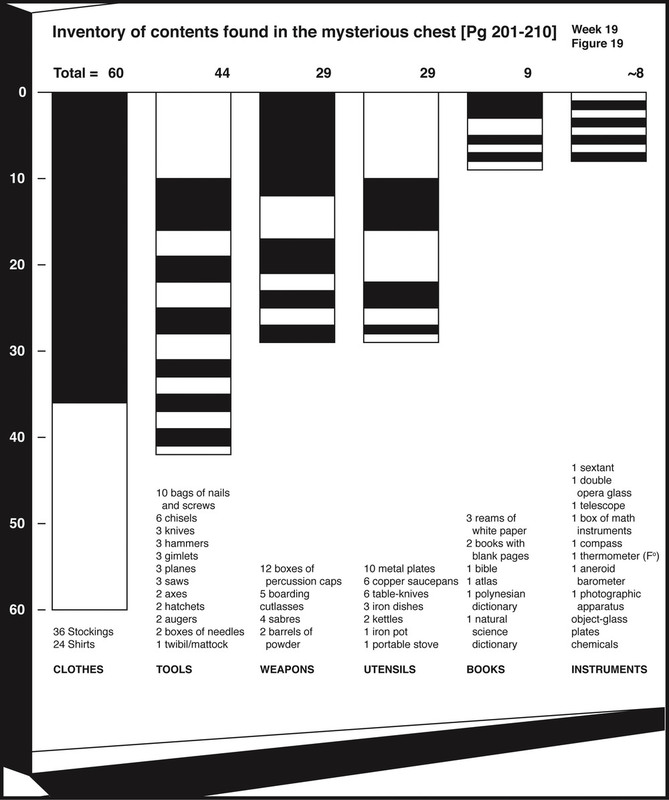 W19_SC This is a standard bar chart that compares the different categories of objects found in the mysterious chest. I did not take into consideration the physical mass or additional properties of the objects, but merely counted them. The resulting diagram feels rather stale; since the source of the information is relatively banal, it compelled me to leave the diagram un-stylized. W19_BT The tried-and-true mind map was my system of choice this week, as I sought to sort out all the clues and theories behind the mysterious events. I like the casual nature of the hand-drawn mind map, which suggests thoughts that are still in flux and multiple options that are still being considered. Although we weren’t technically supposed to bring in data from outside of the week’s ten pages, I decided to integrate some of the prior revelations (in red), since my own retention of this information was part of the reading experience. The expedition continues, and the settlers reach the western coast of the island for the first time. They encounter a jaguar. Spilett shoots it, and they spend the night in its cave. W20_SC This week, I created a relational diagram to convey how different species of plants on the island could be turned into usable products. I organized the information concentrically, using the expanding rings to denote transformation. 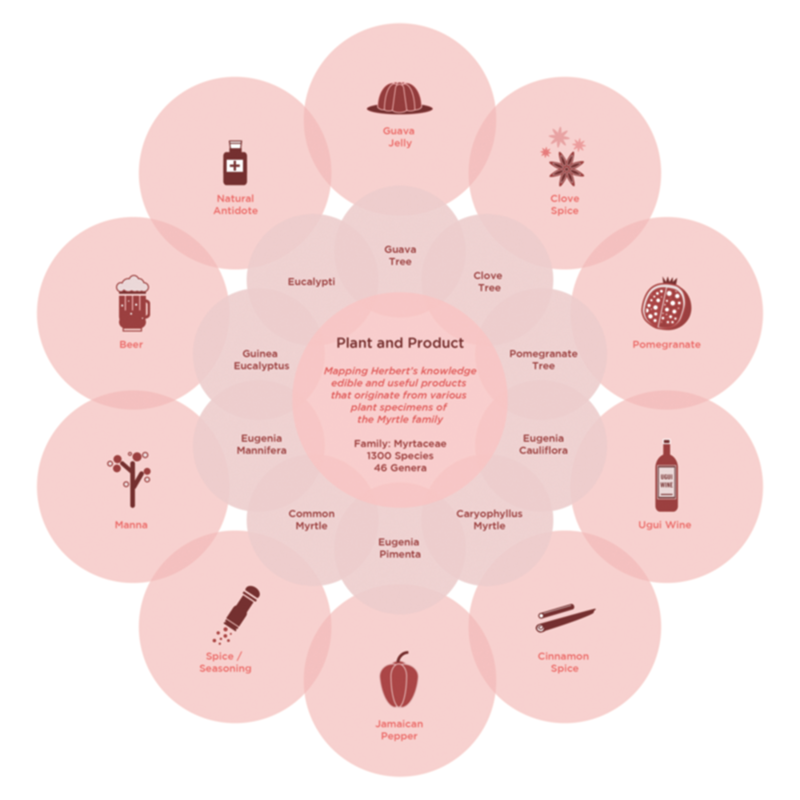 The circles plotted on the inner rings contained names of the plants, while their resulting products were positioned on the outside, represented by icons. The color pink was added in jest due to my sparse use of that particular color; it does, however, lend a floral note that resonates with the vegetal motif. W20_BT Pencroft’s unsettling obsession with hunting – especially marked this week – prompted a search for late 19th century illustrations of all the mentioned animal targets. 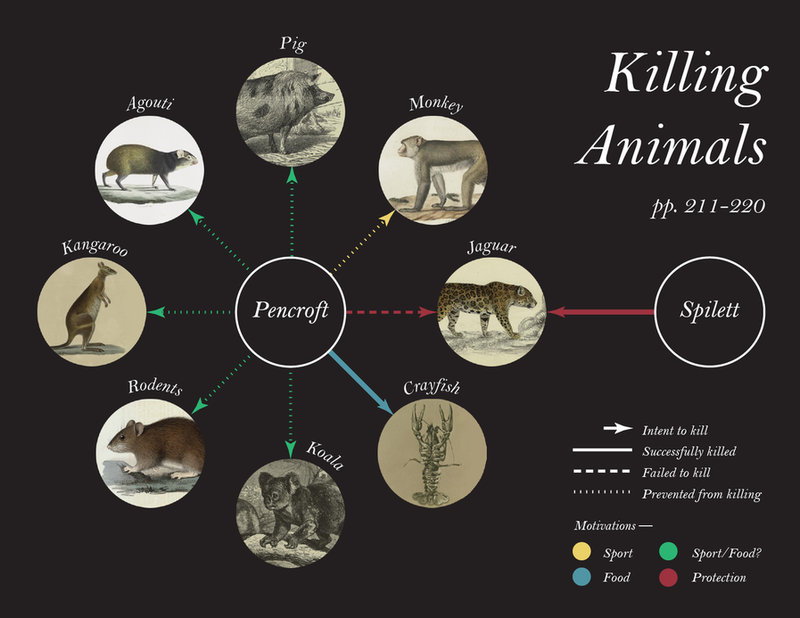 Ironically, the jaguar, the killing of which was most vital to their survival, was killed by Spilett rather than Pencroft. The use of circles in both our diagrams this week was a strange coincidence, especially since we didn’t even choose the same subject matter. The settlers return to Granite House on foot. They discover the remains of their balloon in the trees, and proceed to cut down the valuable cloth and store it in a cave by the shore. Upon reaching the banks of the Mercy, which they had planned to cross with a makeshift raft, they find that their canoe has somehow floated down to meet them. Returning to Granite House, they realize that the ladder at the entrance is missing. W21_SC My diagram this week was composed of an intricately drawn hot air balloon, but not a lot of information. I had lost the keys to my apartment that week and was unable to leave the space for fear of not being able to get back in. Subject to cabin fever, I spent an excessive amount of time (3 hours) illustrating the balloon before casually labelling its various parts. The point of the diagram was to convey how the material from the parachute bag was an abundant resource for the castaways. I called attention to that portion of the balloon, furnishing it with supporting quotes for emphasis. I made the diagram look ‘aged’ as a subtle nod to vintage medical diagrams. W21_BT I once again stretched my interpretation of the term “diagram” this week. Focusing on the disappearance of the ladder that led to the castaways’ base, I designed and printed out a photo collage to represent the geography, then (sloppily) cut out the shape of a ladder to emphasize that it had gone missing. When I scanned it, I included some of the pieces that I had cut out to reinforce the materiality of the technique. Sher surprised me by going for a very different vintage aesthetic this week; while some of her experimentations have prompted me to explore new forms, I never tried to emulate this particular style. Granite House has been invaded by monkeys. When the settlers finally figure out a way to enter their base, they find that the monkeys are now trying to escape for some unknown reason, and start shooting at them until there is only one orangutan left. They name him Jup, and decide to train him to become their servant. Harding suggests creating a moat to protect Granite House from future invasions. The settlers begin building a bridge across the Mercy. W22_SC As a mode of comparison, I developed a binary scoring system to indicate losses or victories between the men and animals of the island in order to express their struggles for power. This allocation of value to the qualitative information enabled me to draw conclusions about who had dominion over the other. W22_BT I was very disturbed by the events in this part of the novel, and that emotional resonance translated into the extensiveness of this week’s diagram. To me, the extermination and subjugation of the apes paralleled the brutality of colonization. Instead of directly illustrating the cruelty, I chose to tease out the systematic nature of the whole affair – which I found chilling – by classifying it into a series of ten stages. I also deliberately included quotes and a simple chart showing the balance of power in order to create as comprehensive a diagram as possible. Aesthetically, it’s not one of my best, but I value this diagram very much. The bridge and the moat are completed. A second cornfield, a poultry-yard, a stable, a vegetable farm, and a corral are established. The settlers also make new sets of clothes and more ammunition. Jup is now domesticated enough to serve their meals. W23_SC This diagram concentrates on the process of animal husbandry. The theme of power is explored once again, as I designed a grid matrix ranking the domestication of animals according to their level of emotional intelligence. I observed that animals with a higher level of cognition are coerced into captivity, whereas animals with less superior intellect are just subject to it. A darker aspect of the diagram is how people are socialized through an illusion of autonomy and choice as well. The aged treatment of the diagram alludes to the fact that animal husbandry is an ancient science. W23_BT This week’s diagram – or rather, list – stands apart from last week’s due to its sheer informality. Verne had already proved himself to be a writer that was detailed to the point of tedium, but I chose to highlight his penchant for including numbers whenever he could (for the purpose of specificity I suppose). I relied on the very basic technique of listing here, but could not shake the sensation that more could be explored with this idea, and would eventually return to it a few weeks later. The settlers continue growing crops, raising livestock, making furniture, and so on. Harding decides to build a lift in place of the ladder. They attempt to manufacture glass, and even find a plant from which to make flour. Harding uses the sextant from the chest to determine the exact coordinates of Lincoln Island. Upon consulting the atlas, the settlers realize that there is an island nearby called Tabor Island. W24_SC This diagram features a textured pie chart mapping the weather conditions on the island. I gravitated toward this definitive aspect of the text due to a bout of seasonal depression. I divided a circle into 31 quadrants denoting the total days of the month. The days of gloomy cold were rendered in a murky purple, while instances of oppressive heat were represented by a glowing orange. I overlayed the portion of text over the colorscape, highlighting weather-related words. I wanted this piece to be more charged with emotional resonance as opposed to being quantitatively accurate. This diagram is an inquisition into the notion of objective representation of information, which was my initial goal for the project. Over the course of visualizing the book, my design sensibilities have often been adjunct to my emotional states. W24_BT This week’s aesthetic was inspired by some decades-old ephemera that I had seen at an exhibition at Artists Space in New York. By this point in the novel, the castaways had amassed significant resources. I arranged the listed resources and assorted wants along a spectrum from necessity to luxury, based on personal opinion. For example, although escape from the island seemed paramount at first, their relatively comfortable lives rendered it less necessary in my eyes. Pencroft is determined to construct a boat for the voyage to Tabor Island. Herbert and Spilett find a tobacco plant, and surprise Pencroft with a filled pipe. The settlers spot a beached whale, which had died after being harpooned by an American whaler. They harvest its milk, blubber, and bones. Later, they transform the wool of their domesticated musmons into garments and bedclothes. W25_SC I made this diagram drunk, so I cannot recall how I latched on to the idea or how I became aware of the German noun Sehnsucht (loosely translated as a feeling of intense longing). The diagram was essentially an attempt to classify the three primary desires of the sailor character Pencroft according to their level of fulfilment. Given that those who had followed our project were only privy to the final output, this diagram is significant in its representation of the pre-diagram stage, an attestation to the process of formulating an idea. Initially, I had been concerned (and a lot of the time disappointed) with trying to produce complete works of design. However, given the extended duration of the project, I began to look at the diagrams not as singular entities, but their implications within a larger body of work. Realizing potential of the diagrams to serve as stimulus for new ideas, I eased off on the expectation of always succeeding in visualizing the information within the ten pages. W25_BT I used the medium of watercolor this week because I wanted to imbue the diagram with something sentimental and almost eulogistic – an ode to the dead whale. In addition, I wanted to present four similar objects using similar colors, but with very subtle variations. I didn’t want to associate four different colors to the four entities, because it would have necessarily presented a value judgment that I didn’t want to make. Furthermore, I wanted to present the idea that the whale’s value is an ambiguous, vague concept. Spilett attaches an account of their journey, addressed to the New York Herald, to an albatross. Harding describes his theory that water will eventually replace coal as an energy source. Later, he investigates the well in the cavern, but finds nothing. Granite House is attacked by colpeo foxes; the settlers kill most of them, but Jup is wounded. W26_SC For most of this project, I have inclined towards systematizing the information. However, this diagram is constructed from the data itself – I made the text into visual signifiers that behave according to what they describe. The tubular form that I have used to depict the dark well makes its return here. Instances where the text describes a light source or an instance of illumination in the well are highlighted in a bright yellow. The sentence ‘points of rocks jutted out here and there’ becomes a recurring protrusion, while the text describing the water in the well is placed at the base of the paragraph, colored in blue. W26_BT I was disturbed yet again by the castaways’ readiness to kill animals; this week, it was a battle with colpeo foxes. Yet, when their domesticated orangutan Jup was injured, they tended to it with so much care. This started me thinking about how human beings’ sense of entitlement is established through clear, finite delineation of roles – the colpeo foxes were a threat, while Jup is one of their own. Under the same umbrella of entitlement was their blind faith that the earth will always provide for our infinite needs with no concern for sustainability. Since this finiteness and infinity are two sides of the same coin, I represented them using the same basic shape. Jup recovers. The vessel is completed and christened the Bonadventure. Though Harding tries to dissuade Pencroft from journeying to Tabor Island, a bottle is found in the sea with a message saying that there is a castaway stranded there. Pencroft, Herbert, and Spilett proceed on the Bonadventure. W27_SC My diagram for Week 27 was crafted in three tiers, with the middle being the sequence of events that occur in the ten pages. Positive emotions are depicted in the top tier and negative in the last. This parallel arrangement enables the viewer to get an unadulterated view of the group’s complex emotional states in conjunction with specific experiences. While I was still revisiting old ideas about underlying insecurities (see Week 14), there was an interesting shift in the way Berny tackles the information. While before she was using form to express text, for this week’s diagram, she used the text as a means of generating form. The data is thus visualized according to a manually implemented algorithmic procedure, whereby Berny assigned attributes to numerical values, creating a visually interesting by-product. W27_BT At this point in the project, I realized that I was starting to experiment with the combination of two separate (and perhaps disparate) events/motifs/themes. This week, I revisited my theme of “numbers” from Week 23 to see if I could push the concept further than just pure listing. Since one of the major plot points in this week’s ten pages was the expedition to Tabor Island, I decided to use the numbers mentioned to create a simple mapping system. As such, my diagram reflects both Verne’s neurotic specificity, and the idea of exploration and travel. Pencroft, Herbert, and Spilett arrive on Tabor Island and find few signs of human inhabitants. Finally, they discover an empty hut and spend the night there. The next day, they come across a savage man, whom they subdue and take aboard the Bonadventure. W28_SC Struck by prose used to describe the state of the marooned man, my diagram traces his degeneration into savagery. I dissected the passage into a series of quotes, curating the diction that I found the most arresting. My categories are loosely based on the dualistic philosophy of Descartes, which explores the distinction between mind and body. The non-statistical nature of the information compelled me to take liberties with the architecture of the diagram. I decided to keep the information relational, opting not to create a base grid. Beneath my constellation of quotes is a dark geometric shape resembling an island, a visual expression of how being stranded on an island corroded the soul of the man. W28_BT Again, I created a diagram that I wasn’t happy with because, despite achieving clarity, I had lost the emotional quality of the text. This week, I wanted to illuminate how the savage on Tabor Island had lost his humanity precisely because he did not have companionship – ideally, the sense of loss should have been extremely palpable, but I had sacrificed it in favor of representing a clear and straightforward system. Upon looking at Sher’s stunning design, I decided that one of the things that was holding me back was my relatively conservative composition. The Bonadventure struggles to return safely, until Pencroft spots a light from a fire in the distance, leading them back to Lincoln Island. The settlers attempt to communicate with the savage; one day, he weeps, and Harding declares him a man again. W29_SC Given that my previous week traced the degeneration of the savage, there was an inherent need to exemplify the re-illumination of his soul. The same schema is utilized again, but the diagram takes the form of concentric circles, playing to the imagery of blooming. Ayrton’s ability to feel sorrow marks the pivotal moment at which he regains his humanity. Berny used an existing photograph as a representational map for plotting the information. Her skillful integration of form and image allows the viewer to navigate the information by using aspects of the composition as markers, lending an extra layer of engagement to the text. W29_BT This is one of my favorite diagrams, in terms of both process and product. It was inspired by one of the most poetic sections of the novel – a description of the savage’s behavior and the hints of his internal turmoil. In particular, I was struck by the sentence, “Did a brighter light burn in the depths of that obscured mind?” Upon reading this, I couldn’t get the image of a ‘dark sun’ out of my mind. I was in London at the time and happened to have taken a photo of the sun shining over the trees and water at Hyde Park that day, so I inverted the colors of the image to achieve the ‘dark sun’ effect. I then linked excerpts from the text into other elements in the image, analysing this conventional pictorial landscape as if it were his own psychological landscape. The savage (Ayrton) finally speaks, and reveals that he had been stranded on Tabor Island for twelve years. He runs off, and the settlers continue work on their settlement. One day, the savage saves Herbert from a jaguar. They persuade him to stay, but he insists on living in a wooden house in the corral, rather than with them at Granite House. W30_SC In this diagram, I track the alternating discourse between the castaways and Ayrton as they try and piece together fragments of his background and origins. The dialogue is separated into two columns that run parallel to each other. ‘Questions’ are highlighted in red and answers remain in black. Parts of the text that were merely speculative are indicated in grey. The course of the conversation is delineated by a series of arrows. W30_BT This week, I built on the idea from Week 27 of creating abstract imagery by locking on to specific aspects of the text. I noticed that there was a “rhythm” in the back-and-forth between Ayrton and the castaways as the latter try to find out more about the former’s story. (Sher noticed the same thing as well, though her interpretation included the text.) These two sides weave in and out of a shared space, using the number of lines in the text as a formal structure to determine changes in direction. Of course, even as they seem to be on the same page, there is always that tense, narrow space in between them, as Ayrton remains reclusive. The savage relates his story (the plot of Jules Verne’s previous novel, In Search of the Castaways). In short, he reveals that he was a pirate named Ayrton, and that he was left on Tabor Island as punishment. Ayrton was driven to savagery by solitude and remorse. He is adamant that he never threw the message-in-a-bottle into the sea, and the settlers are mystified. W31_SC In the previous week’s ten pages, the castaways were confronted with having to fill in the gaps of Ayrton’s past. However, in Week 31, I laid out the contents of his life all the way up to his point of estrangement through a deconstruction of his story. I then charted the information according to people encountered and places traversed. Geographical location and physical surroundings in which his body is situated were represented vertically. Circles containing labels of the names and types of people with whom he crossed paths were plotted on horizontal lines extending from each designated place. Due to Ayrton’s tainted past, the circle representing him is always black. The diagram ends with Ayrton on Tabor Island in solitude, thus his circle is situated on the white space on the right side of the bounding area. W31_BT Most of the time, when Verne deliberately writes in a quantifiable manner, Sher and I find our diagrams converging. This week was no different, as Ayrton’s story is recounted with an emphasis on a rotating cast of characters journeying across the world. However, while Sher focused on the people, I attempted to show both the number of people and how they progressed from West (South America) to East (Australia), taking some aesthetic inspiration from Piet Mondrian. In the end, I felt that the elements were drowning in the vastness of the structure. The settlers build a telegraph system to communicate with Ayrton, who has chosen to live permanently at the corral. Herbert experiments with the photographic equipment from the chest. The settlers embark on a survey of the coast. W32_SC In week 32, my diagram shows how photography and echoes are similar in their roles as multiplication channels. I used repeating rectangles to emphasize this concept. W32_BT Much like in Week 3, I latched onto a small section of the novel that contained particularly palpable descriptions of the island’s physical geography. As I read this section, I saw each feature that Verne described, not as the natural phenomena that they were, but as geometric shapes across a horizon. I then drew these shapes out on graph paper with a simplicity that echoed an illustrated children’s book from my early memories. Harding reveals that he never lit a fire on the night that the Bonadventure was making its way back from Tabor Island. The settlers begin to consider that there is something supernatural about all the mysterious incidents. They pass their third winter on the island in Granite House. W33_SC I created this diagram in the throes of a high fever. Having set a self-imposed parameter to not read ahead of the ten pages per week, I became obsessed with all the bizarre incidents on the island, being unaware of their cause. The goal of the diagram was merely to compare the ratio of mysterious events in the first part of the book against the second. However, the form of the diagram definitely fell short of that for a number of reasons: first, the grid on which I had decided to plot the incidents was an arbitrary element, and the visualization could have adapted a better form. Second, the scale of the text and choice of color also made the information illegible on screen. The unattractively murky colors of the diagram, were distilled from a screenshot from a Wes Anderson movie The Darjeeling Limited. W33_BT I returned to the the idea of creating abstract imagery by locking on to specific aspects of the text, explored in Weeks 27 and 29. This section of the novel contained a lot of dialogue, and I noticed that Cyrus Harding, as the leader of the group, often issued calls-to-action, or prompted the group to ask questions about their time on the island. Thus, I distinguished between ‘passive’ and ‘active’ dialogue by assigning a taller rectangle to the latter, in order to show that those lines propelled the novel. This diagram was originally designed using RGB colors to emulate retro computer pixelation, but I had to change it to duller CMYK colors for print.